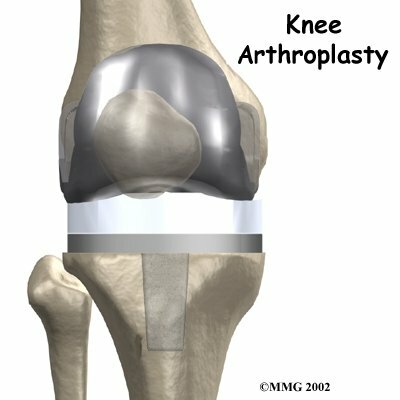 Welcome to Dynamics Physical Therapy's patient resource about Artificial Joint Replacement of the Knee. Once you decide to proceed with surgery, several things may need to be done. Your orthopedic surgeon may suggest a complete physical examination by your regular doctor. This is to ensure that you are in the best possible condition to undergo the operation. You may also need to spend time with the Physical Therapist who will be managing your rehabilitation after the surgery. The Physical Therapist will begin the teaching process before surgery to ensure that you are ready for rehabilitation afterwards. A second purpose of the preoperative Physical Therapy visit is to prepare you for your upcoming surgery. You will practice some of the exercises used just after surgery. You will also be trained in the use of either a walker or crutches. (Whether the surgeon uses a cemented or noncemented artificial knee will determine how much weight you will apply through your foot at first while walking.) Finally, an assessment will be made of any needs you will have at home once you're released from the hospital. 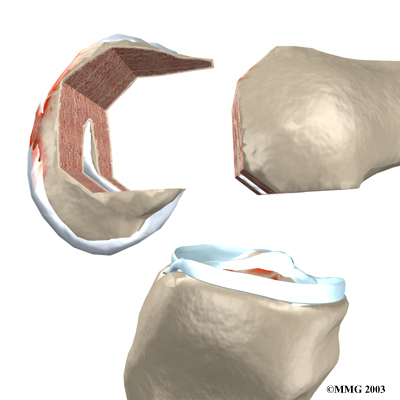 The tibial component (bottom portion) replaces the top surface of the lower bone, the tibia. The femoral component (top portion) replaces the bottom surface of the upper bone (the femur) and the groove where the patella fits. 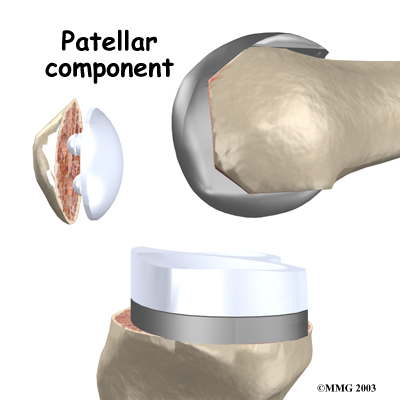 The patellar component (kneecap portion) replaces the surface of the patella where it glides in the groove on the femur. 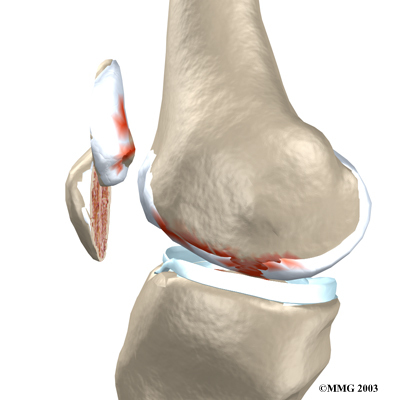 To begin the procedure, the surgeon makes an incision on the front of the knee to allow access to the joint. Several different approaches can be used to make the incision. The choice is usually based on the surgeon's training and preferences. 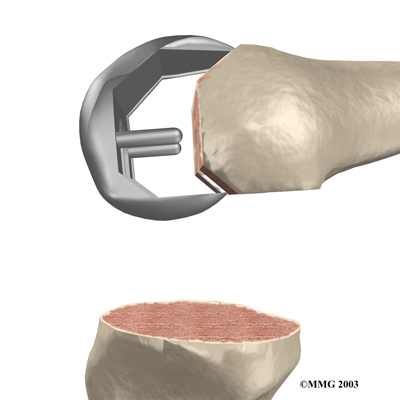 Once the knee joint is opened, a special positioning device (a cutting guide) is placed on the end of the femur. This cutting guide is used to ensure that the bone is cut in the proper alignment to the leg's original angles, even if the arthritis has made you bowlegged or knock-kneed. With the help of the cutting guide, the surgeon cuts several pieces of bone from the end of the femur. 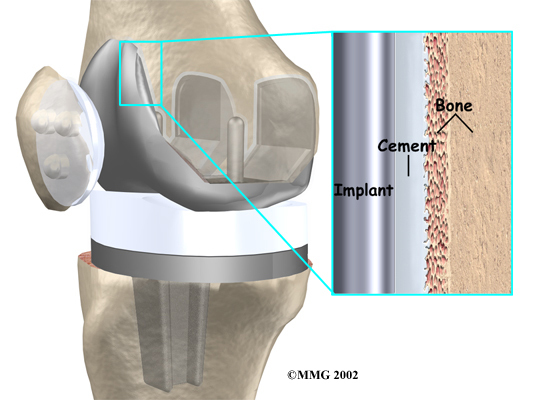 The artificial knee will replace these worn surfaces with a metal surface. Next, the surface of the tibia is prepared. 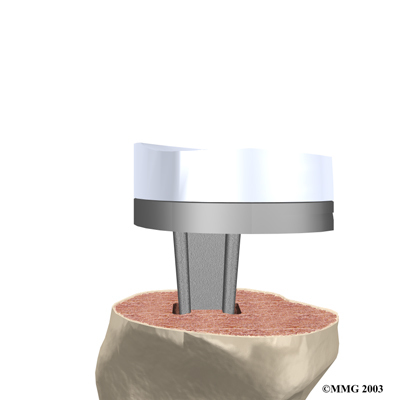 Another type of cutting guide is used to cut the tibia in the correct alignment. 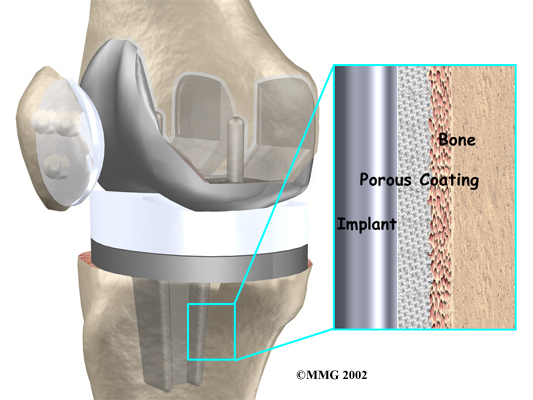 Then the artificial surface of the patella is removed. 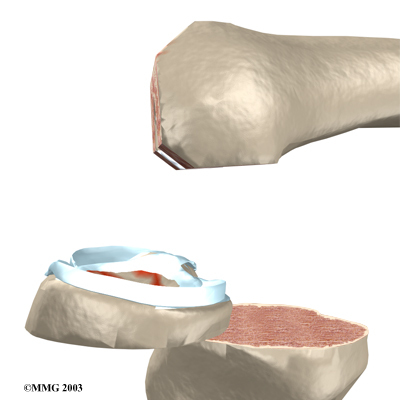 The surgeon then sizes the patellar component andd puts it into place behind the patella. This piece is usually cemented in place. When you are stabilized, your Physical Therapist will help you up for a short outing using your crutches or your walker. When you begin your Dynamics Physical Therapy rehabilitation program, our Physical Therapist may use heat, ice, or electrical stimulation to reduce any remaining swelling or pain. You should continue to use your walker or crutches as instructed. If you had a cemented procedure, you'll advance the weight you place through your sore leg as much as you feel comfortable. If yours was a noncemented procedure, place only the toes down until you've had a follow-up X-ray and your Physical Therapist directs you to put more weight through your leg (usually by the fifth or sixth week postoperatively). Our Physical Therapist may use hands-on stretches for improving range of motion. Then strength exercises are added to address key muscle groups including the buttock, hip, thigh, and calf muscles. Endurance can be achieved through stationary biking, lap swimming, and using an upper body ergometer (upper cycle). Dynamics Physical Therapy Physical Therapists sometimes treat patients in a pool. 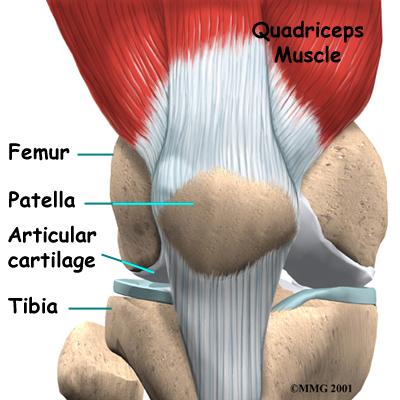 Exercising in a swimming pool puts less stress on the knee joint, and the buoyancy lets you move and exercise easier. Once you've gotten your pool exercises down and the other parts of your rehab program advance, we may instruct you in an independent program. When you are safe in putting full weight through the leg, our Physical Therapist will choose several types of balance exercises to further stabilize and control the knee. Finally, we will use a select group of exercises to simulate day-to-day activities, such as going up and down steps, squatting, rising on your toes, and bending down. Specific exercises may then be chosen to simulate work or hobby demands. 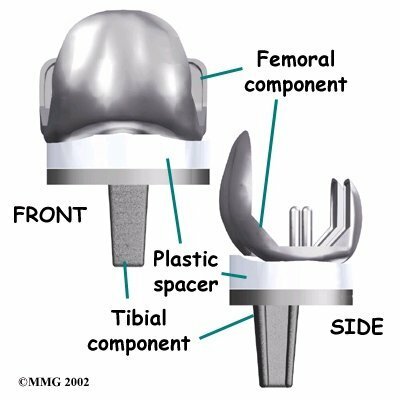 Many patients have less pain and better mobility after having knee replacement surgery. Our Physical Therapist will work with you to help keep your knee joint healthy for as long as possible. This may require that you adjust your activity choices to keep from putting too much strain on your new knee joint. Heavy sports that require running, jumping, quick stopping or starting, and cutting are discouraged. Cycling, swimming, and level walking are encouraged, as are low impact sports like golfing or bowling. At Dynamics Physical Therapy, our goal is to help you improve knee range of motion, maximize strength, and improve your ability to do your activities. When your recovery is well under way, regular visits to our office will end. Although we will continue to be a resource, you will be in charge of doing your exercises as part of an ongoing home program.